It’s just not healthy for me to watch documentaries or shows that deal with natural disasters. My mind can’t fathom it, and I go into a silent panic mode. I sit in fear watching things like The Weather Channel’s “Storm Stories”, to the Discovery Channel’s special programs on any other disastrous events that can take place. I don’t even like watching the news at night. Madelene (my girlfriend) always puts it on so she can see the weather for the next day—and I’m like, “NO! Get your weather elsewhere! I can’t watch this stuff!” I finally figured out why I get most anxiety attacks at night---it’s because I watch the news right before going to sleep. Anyway, yesterday I was watching a documentary on volcanoes. Why in the world would “I” have to be concerned with the threat of a volcano erupting? I live in New York—not Hawaii. I figured this would be a ‘safe’ show for me to watch. I was wrong. More Ativan please, and pass me a beer while you’re at it! So, I was watching the Discovery Channels docudrama, “Supervolcano” last evening. It's located in Yellowstone National Park. To my surprise, we can end up with a whole new ice age if this volcano erupts. The strange thing about it is, it’s so large underneath the surface, that there is no ‘mountain’ or ‘volcano top’ to erupt from. The ground just bursts up into the sky like a huge nuclear-like explosion. 1,000 cubic kilometers (240 cubic miles) of magma (partially molten rock) can erupt. The last time something like this happened was approximately 74,000 years ago at the Toba Caldera in Sumatra, Indonesia. The scary part (besides living nearby) is that the ash can spread throughout most of the United States. This has happened before way before we were here, and caused catastrophic results. The ash in itself has millions and millions of little glass-like shards that gets distributed in your lungs when you breathe in. Crops would be ruined and the United States’ population would practically diminish; almost making humankind extinct. 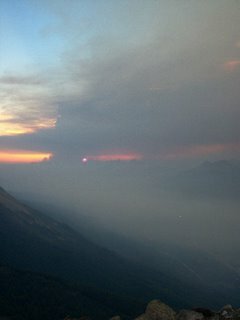 The ash that gets rises into the atmosphere would have drastic changes to the global climate---leaving our crops and vegetations next to none and causing famine. I have no idea why I end up watching these shows that deal with natural disasters and other potential catastrophes. They did mention that it can be a very long time until we something like this happen, but it’s a definite possibility at any given time. So what are we to believe? Can they accurately predict when we’re at a ‘warning level’? They say they can, but for some reason, it doesn’t sit well with me. It took a long time before I could get any sleep last night. I didn’t realize why I had insomnia. Was I planning to wipe out the shelves of the supermarket? Maybe I should pack my storage room full of gallons and gallons of water and canned foods? When do we know it’s safe to say, “Let’s go shopping for a potential catastrophe?” Or should be more lax and just let things happen as they naturally do? “I thought you had faith in God!” They all say, as I rant about the dangers of the earth. I do have faith in God, and I believe that we are in the times of the Revelations, but my anxiety disorder won’t have it. It’s freaking out. It’s saying, “Run! Go to the supermarket and get your supplies! Pack your bags and move to another country! Quick!” With my luck, my boat will sink traveling to my new location. I guess we can’t fear things like that or we’ll all go crazy. Just let me go crazy. I’ll do it for all of you.